Wrap yourself in comfort this season with a bowl of steaming soup. On the following pages, you’ll find a soup to satisfy just about every taste — from seafood to vegetables. If you’re looking for a casual way to entertain family or guests, why not host a soup buffet party served in your kitchen? 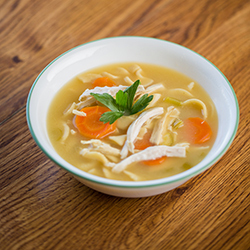 Let these soup ideas keep winter’s chill at bay and surround you with the flavors from these homemade creations. 1. In a large saucepan over medium-low heat, cook onion in butter until tender but not brown, about 3 to 5 minutes. Add squash and stock or broth; heat to a boil over high heat. Reduce heat to low; cover and simmer for 30 minutes or until the squash is tender. 2. Place milk in a medium saucepan. Cut a piece of cheesecloth into a square measuring 6 inches by 6 inches. Place mint sprigs, cinnamon stick, cloves, peppercorns and pepper flakes on the square of cheesecloth. Gather the ends of the cheesecloth in the center and tie ends together with a piece of kitchen twine. Place the cheesecloth pouch in the saucepan and bring milk to a boil over medium-low heat. Remove saucepan from heat and remove cheesecloth pouch. 3. 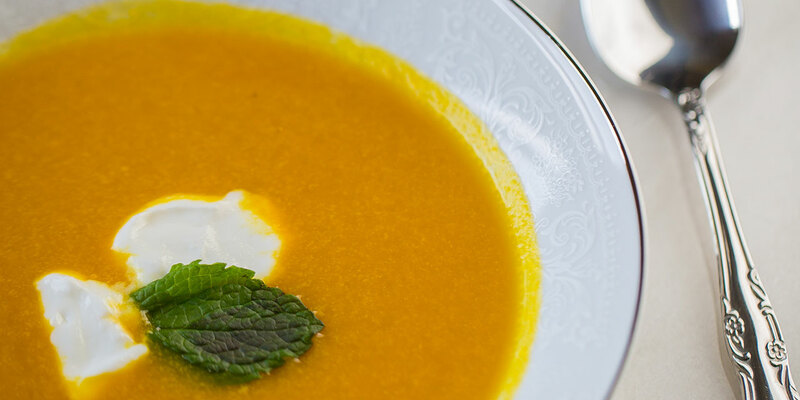 When squash is tender, purée squash mixture in the saucepan using a handheld immersion blender or in a food processor or blender (in batches) until the mixture is smooth. Return puréed squash mixture to saucepan, place saucepan over medium-low heat and add infused milk. Season to taste with salt. Warm soup until heated through. Serve topped with mint sprigs and sour cream, if desired. Makes 6 servings. 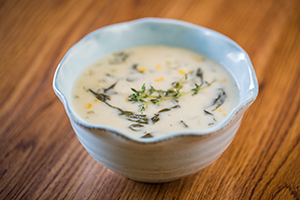 You can substitute Gruyere cheese for the sharp white cheddar cheese in this soup. 1. In a large saucepan over medium-high heat, combine the vegetable stock or broth, potatoes, onion, celery, thyme and black pepper. Bring mixture to a boil; reduce heat and let simmer, covered, for 12 minutes. Add the corn, escarole or cabbage, and bell pepper. Cook, covered, for 7 to 8 minutes more, or until the potatoes and corn are tender, stirring occasionally. 2. In a screw-top jar, combine ½ cup milk and the flour. Shake well, then add to vegetable mixture in the saucepan along with the remaining milk. Cook and stir until the mixture is thickened and bubbling. Cook and stir for 1 minute. Remove saucepan from heat. 3. Add cheese to the vegetable mixture, stirring until the cheese is melted. To serve, ladle soup into bowls. If desired, top each serving with thyme sprigs. Makes 6 servings. Coarsely chopped Italian tomatoes (sold in cardboard cartons) create the best consistency for this stew. If you can’t find them in the supermarket, you can use the canned variety. 1. Slice leeks in half lengthwise and cut into ½-inch dice. 2. In a large saucepan, heat olive oil over medium heat. Add leeks; sauté, stirring frequently, until the leeks are translucent, about 8 to 10 minutes. Add carrots and spices; lower heat to medium low and cook until the carrots are tender, about 5 to 7 minutes. 3. Add tomatoes, chicken stock or chicken broth, and 1 cup water. Bring to a boil and reduce heat to medium low; cook for 4 to 5 minutes. 4. Stir in shrimp and scallops; cook until the shrimp and scallops become opaque, about 5 to 7 minutes. 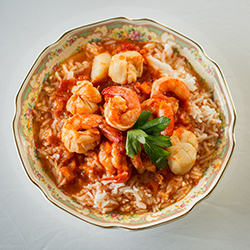 Remove from heat, add parsley, and serve over cooked basmati rice. Garnish with whole parsley leaves. Makes 4 to 6 servings. 1. In a 3-quart saucepan, simmer stock or broth over medium heat. Add chicken breasts, and poach until opaque and firm, about 10 to 12 minutes. Transfer chicken breasts to a plate. Add carrots and celery to the broth, and cook until fork-tender, about 12 minutes. 2. Add egg noodles and cook until the noodles are tender, about 7 to 8 minutes. Shred chicken into 1-inch strips with your hands. Add chicken to the pot, and simmer until the chicken is heated through, about 2 to 3 minutes. Season with salt and pepper. 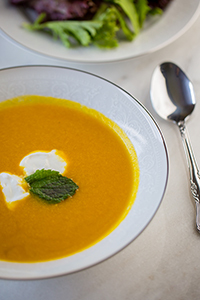 Ladle into soup bowls, garnish with parsley sprigs and serve. Makes 4 to 6 servings.